Dressing up your bathroom with discount accessories is a great way to add some nice detail to your décor and will also save you money in the process. Following are a few of the items you might want to consider when taking on the task of a do-it-yourself bathroom redecorating project. Who doesn't hate walking onto a wet bathroom floor first thing in the morning? There's just something so annoying about a soaking wet bathroom floor and not only that, but it's downright dangerous because somebody could slip and hurt themselves. One way solve this problem is to invest in a good bath mat. They're not the same drab old items that they used to be either. You can get discount bath mats in a wide (and wild) variety of shapes, sizes and colors. Just make sure whatever mat you choose is highly absorbent and easy to launder. Having a nice, long, relaxing soak in the tub is an ideal way to spend anevening. Mopping up water from a bath that has over-flowed onto the floor is not. Why not invest in a Water Level Bath Alarm to make sure this never happens to you? You won't have to keep a constant eye on the tub as it fills because an alarm sounds when the water reaches a certain level. 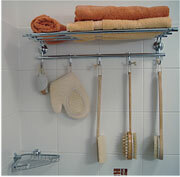 You can find these handy, helpful items on discount bathroom accessory sites for about only $10 each. Bathrooms can become very messy places. Soap wrappers, cotton balls and empty toiletry items will need to be disposed of at some point. An idea here is to purchase a waste basket that is easy to use like a pedestal bin. The trash is sure to reach its destination because as you step on the pedal, the bin pops open to reveal a sufficiently-sized area for disposal and then closes so that the trash is out-of-sight. These types of trash bins are aesthetically pleasing and very hygienic and although they tend to be a little pricey, you can purchase one through an online discount bathroom accessory resource. The days of boring shower curtains are far behind us. Presently, we're quite literally spoiled for choices when it comes to shopping for these necessary items. There come in styles ranging from plastic to fabric with patterns in numerous colors and designs. What's also nice about shower curtains these days is that coordinating hooks and liners can also be purchased to further enhance your bathroom design scheme. Before you start looking online for any discount bathroom accessories, bear in mind that you'll want to pursue a consistent theme so that your finished bathroom has a balanced look and feel to it.